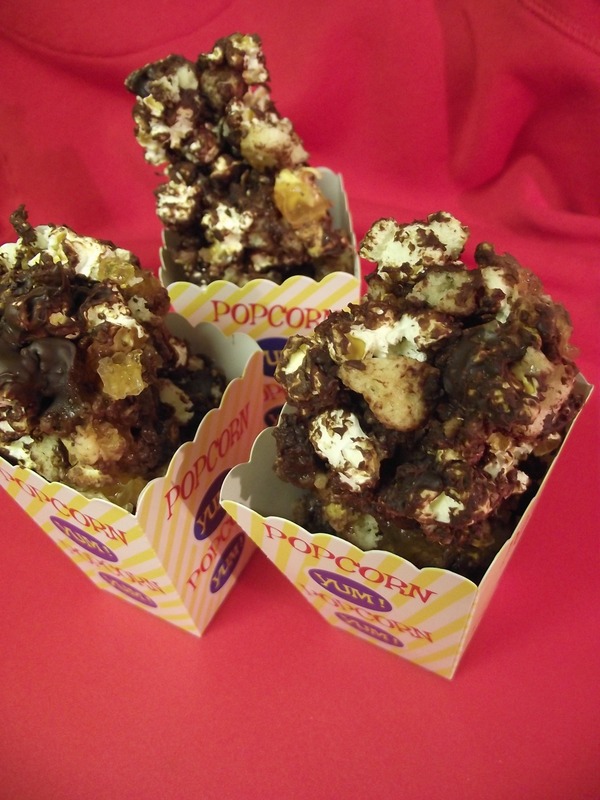 I have no idea what inspired me to try this recipe, other than the cute little popcorn boxes I bought from TK Maxx a while back. I didn’t want to chuck in plain old popping corn, so wondered how I could pimp it up. I also was having a much on Jaffa Cakes at the time, so thought why not try and combine the two? Jaffa Cakes are that perennial British favourite biscuit – or is it a cake? It’s an old question, probably dating back many a year, but the taxmen got their knickers into a fankle over it due to variances in VAT between cakes and biscuits. Apparently they decided it was a cake. But I will always think of it as a biccy. 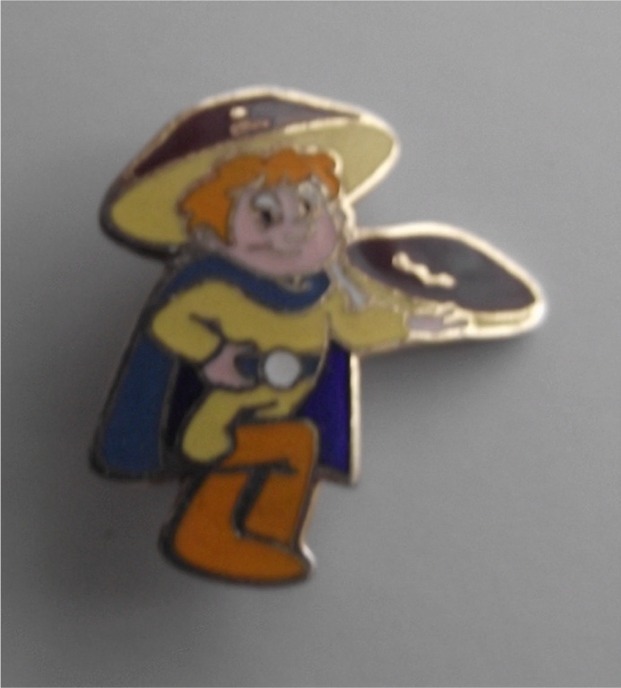 I used to be a member of the McVities Jaffa Cake Club back in the day ( I was a large child) but all I can really remember about that was getting some free stickers and an enamel badge, (which I just found in my old badge collection!). 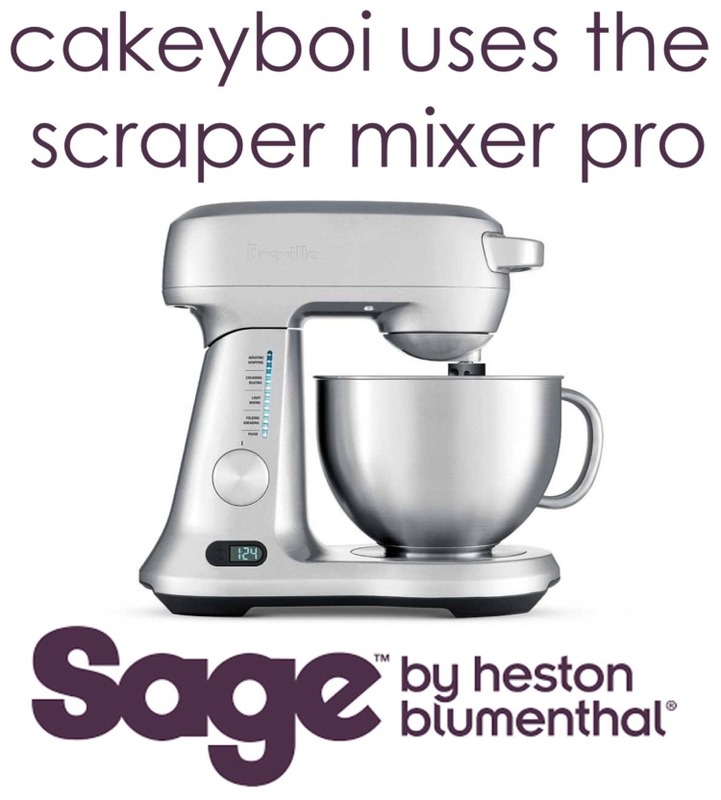 Begin by making your ‘smashing orangey bit’. Make your orange jelly as directed on the pack, but use a quarter less water. The instructions on my pack said to make up to a pint, I did mine to three quarters of a pint. 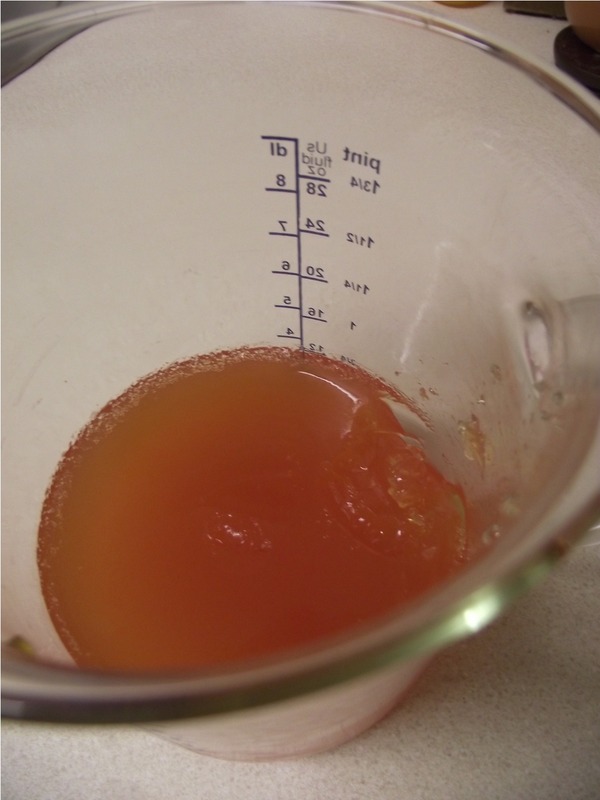 Stir in the tablespoon of marmalade until it melts in the hot water and set aside to let the jelly set. 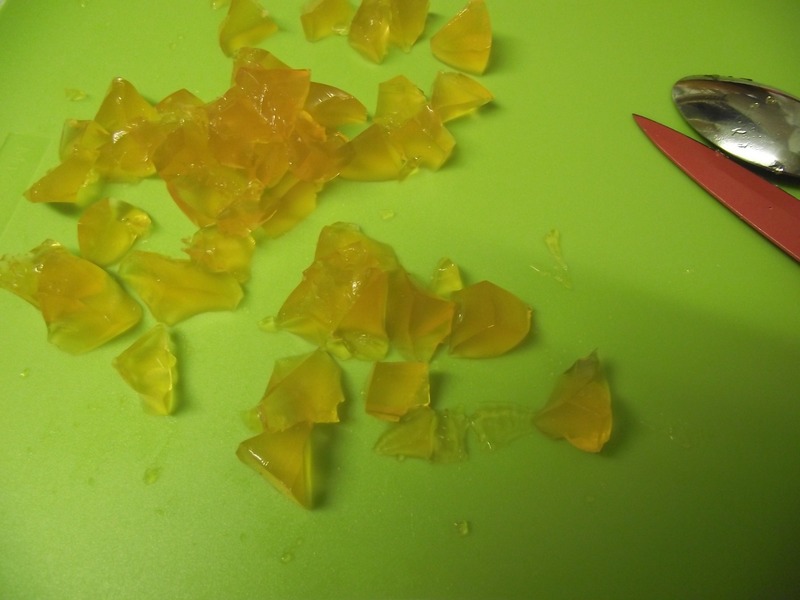 You won’t need all the jelly, but the remainders you could always snack on. 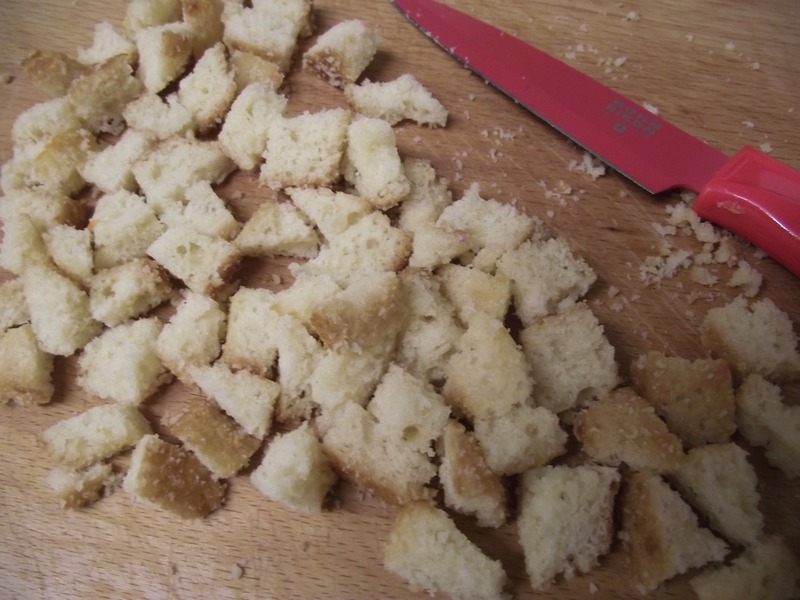 Take the vanilla muffins and chop these into half-inch cubes also. 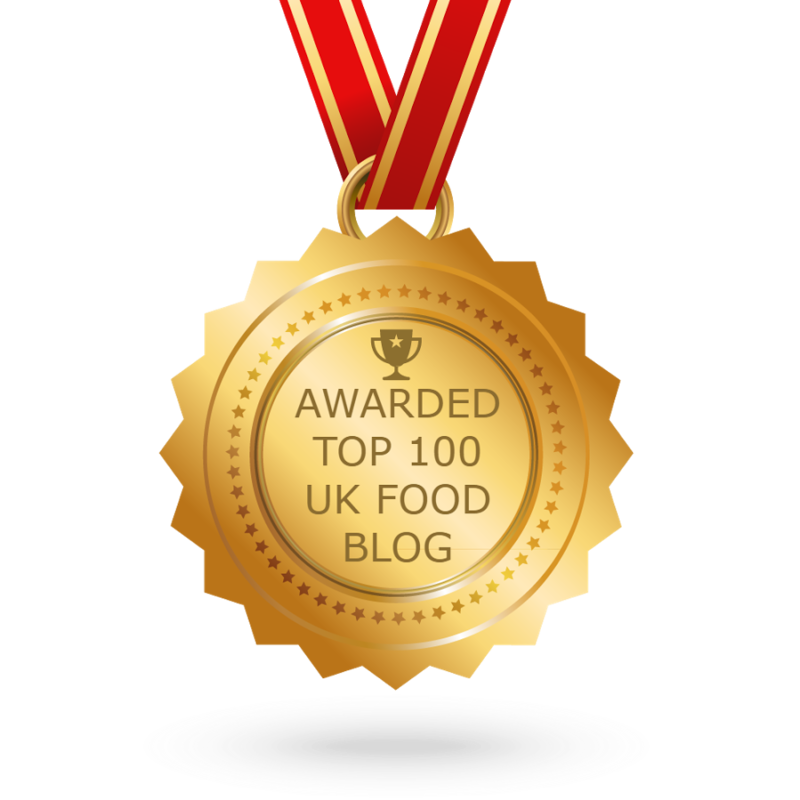 Leave them on the cutting board whilst the jelly sets, so they go a little bit hard – just like the sponge cake bottom. I could have gone to the bother of making muffins, but for this recipe, store bought was fine. Pop your corn if you haven’t done so already. 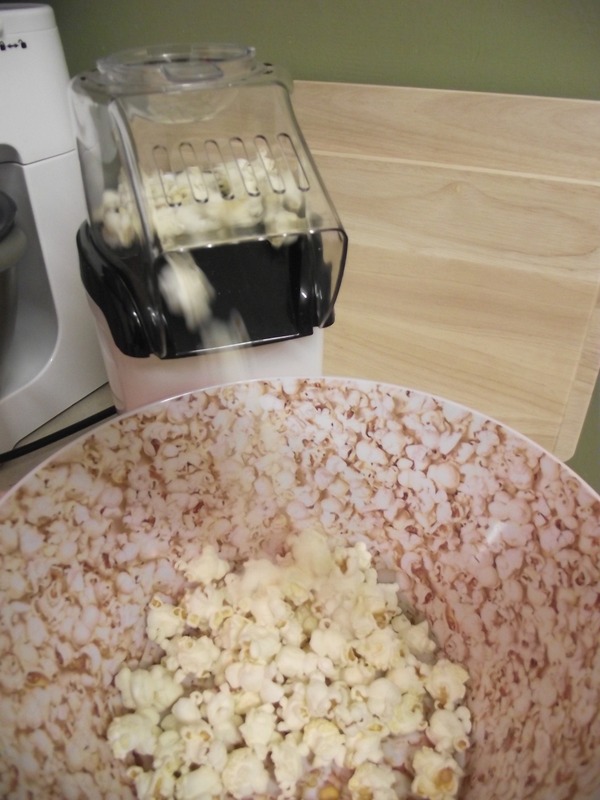 I use a popcorn maker, as this involves no fat and is a wee bit healthier. Leave this to cool slightly. After the jelly is set, scoop a few spoonfuls of the jelly onto a chopping board and cut with a knife into little half-inch chunks. It should be pretty firm from adding less water, but still jelly like. 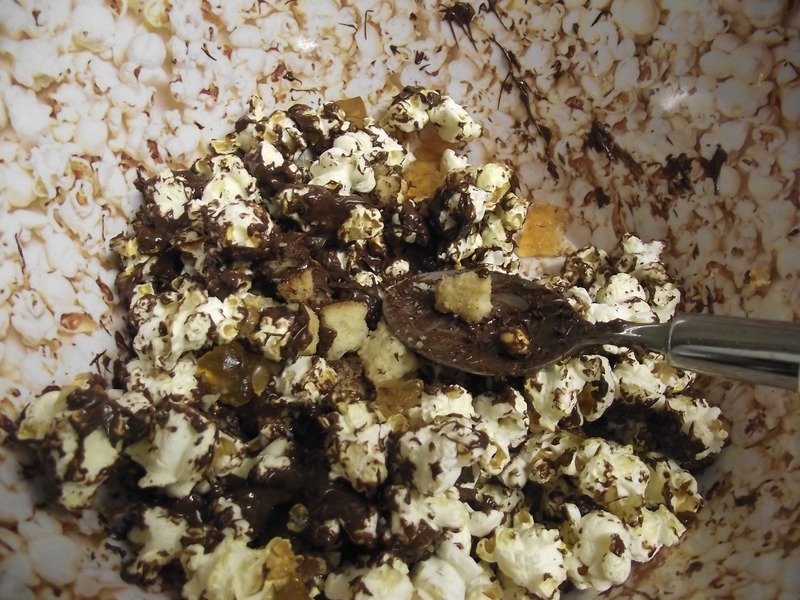 Combine the sponge cubes, jelly cubes and popcorn in a large bowl giving it a good stir. 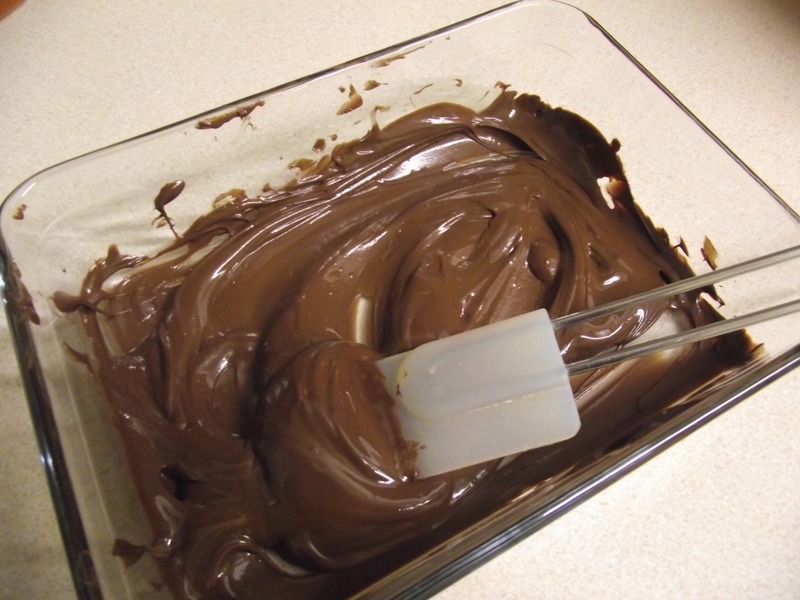 Next melt the chocolate chips, either in a bowl over a pan of simmering water, or in the microwave. Give this a good stir and then drizzle over the popcorn. Mix this through thoroughly. Now you can eat this with the chocolate slightly molten, so you get nice and messy, or you could wait a while until the chocolate sets – up to you. Don’t let it set in the fridge however as this will make the popcorn stale up. 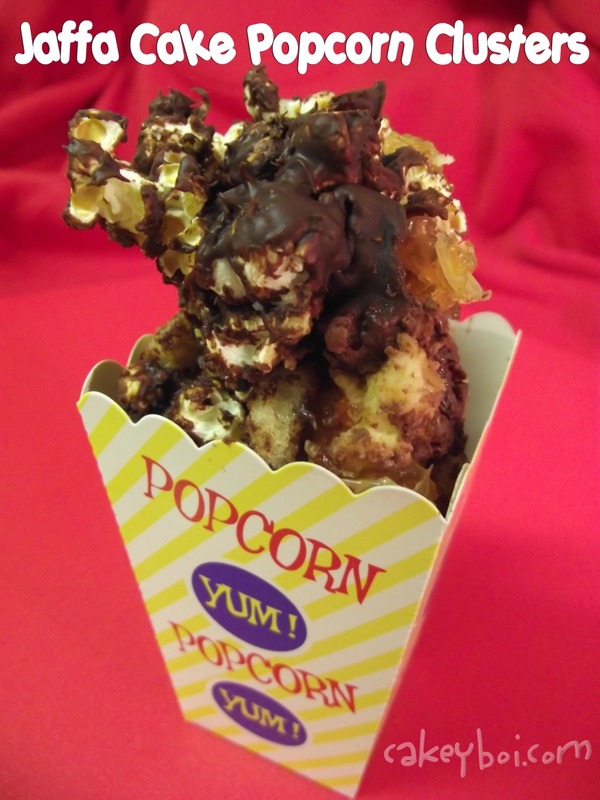 So there you have Jaffa Cake Popcorn Clusters – they do taste very Jaffa Cakey-ish what with all the elements of the cake, the marmalade in the jelly really does add another element to the orange. Enjoy…! That's a monster movie of a snack.